Once again, I have no particular memory of buying this issue of WONDER WOMAN. but I still have it, so I must have done so. It’s another installment in the “Wonder Woman’s Twelve Labors” cycle of stories wherein Wonder Woman needed to prove herself to her compatriots so as to regain her place in the Justice League of America. That JLA connection was likely the reason for my continuing interest. 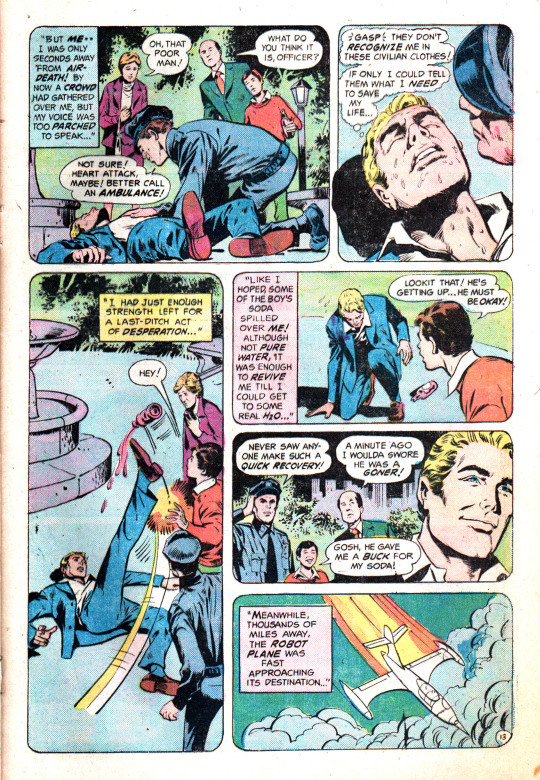 More inking by Vince Colletta muddies up the unspectacular penciling from John Rosenberger–it’s a pretty pedestrian piece of work. But Cary bates’ story is fun, as usual. 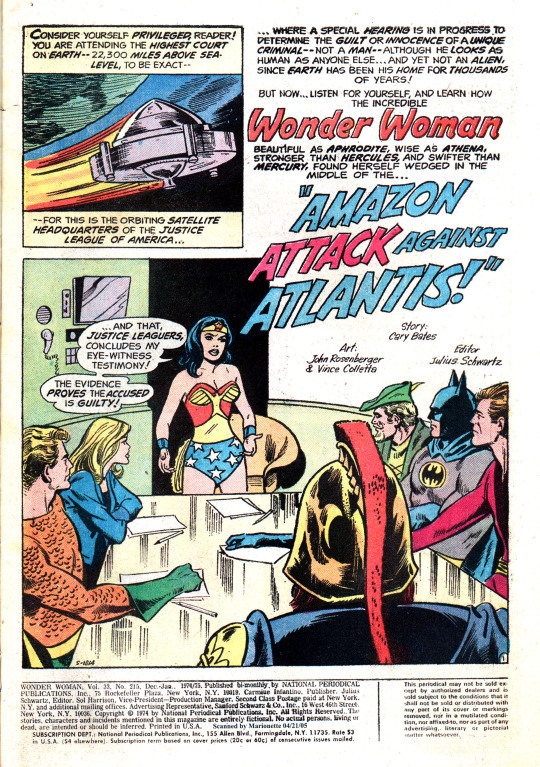 Things open up in the satellite headquarters of the JLA, where Diana has brought a mysterious helmeted man for trial. His identity is concealed, but the cover has already revealed that this is Mars, the God of War. 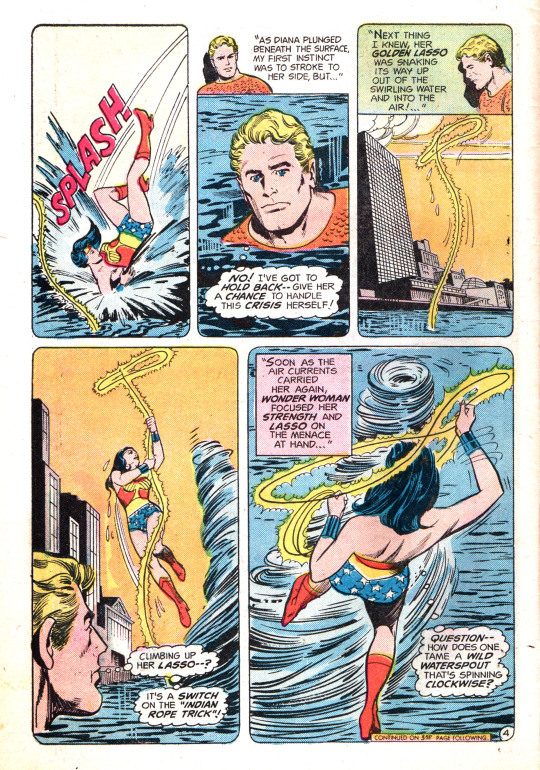 Aquaman recounts how he was on the scene when a waterspout attempted to destroy Wonder Woman, and he observed the silhouette of Mars at the time. 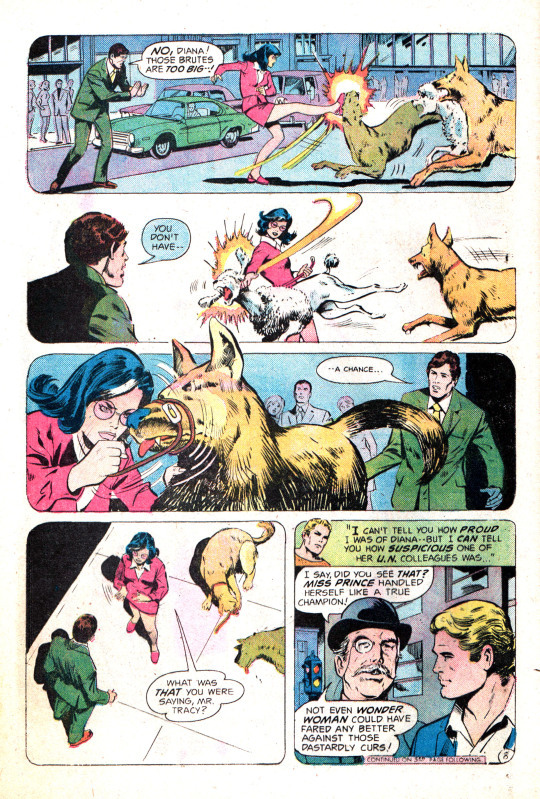 Later, on dry land, a pack of dogs suddenly goes feral and attempts to finish off Wonder Woman, now in her Diana Prince identity, but she makes short work of them without any powers. When one of the bystanders suggests that Diana might really be Wonder Woman, Aquaman leads the guy off the scent, by suggesting that if Diana were Wonder Woman, she’d never take action so overtly, a fun twist on the typical Clark Kent scenario. 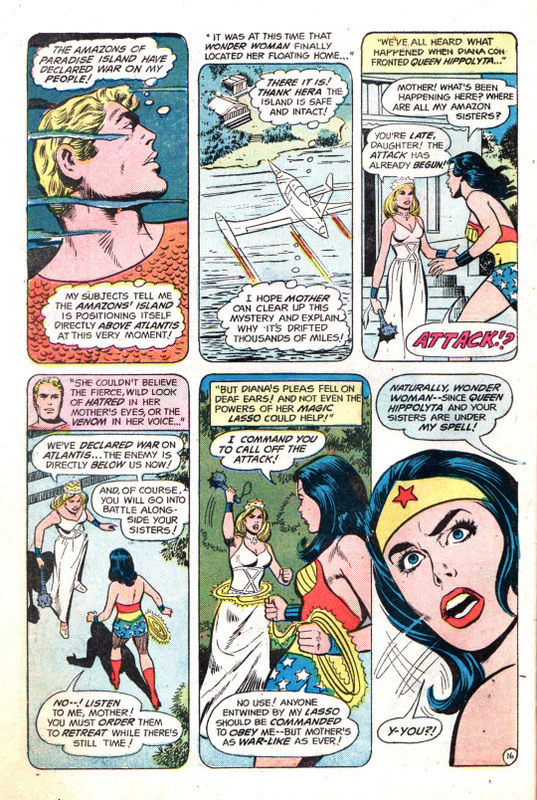 All throughout, Wonder Woman has attempted to contact her sisters on paradise Island, to no avail. So she decides to fly there in her invisible plane to see what’s going on. Aquaman has a crisis of conscience–Paradise Island’s location is a secret, should he follow Diana to it?–and is so caught up in weighing it that he forgets to douse himself with life-giving water for almost an hour. Even worse, the water of a nearby fountain turns to oil and attacks the invisible jet, leaving Aquaman dying nearby. 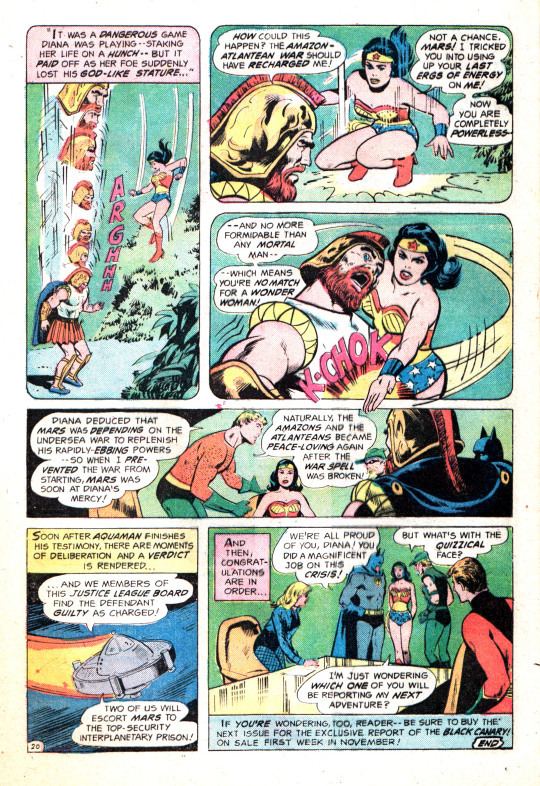 Wonder Woman is able to free herself and her plane, and continue on towards paradise Island, and Aquaman is able to kick a bystander’s drink onto him, giving him the moisture that he needs to survive. But then we begin to get down to the nitty-gritty of the plot, as Diana discovers that paradise Island is missing. 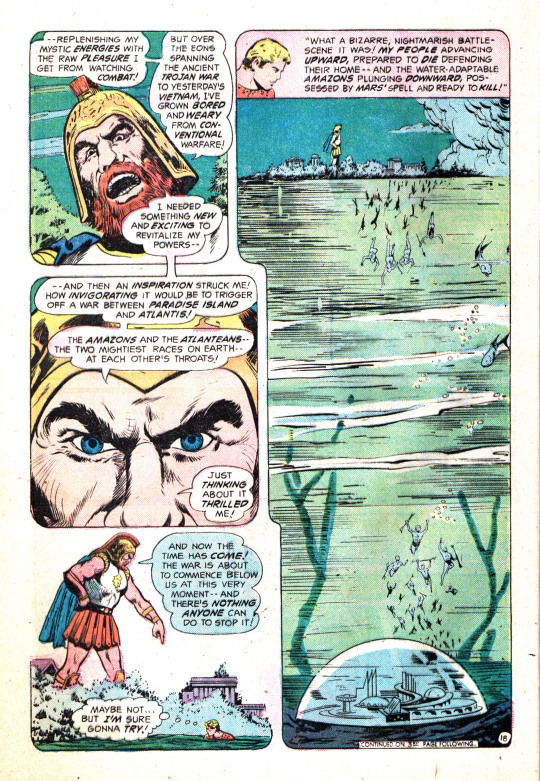 Aphrodite assists her by pointing the way to the relocated island, while Aquaman’s fishy friends convey the news to him: the Amazons have declared war on his home of Atlantis! Aquaman orders a group of whales to position themselves between the two attacking armies while Wonder Woman takes on Mars–who, because the war hasn’t come off, is rendered powerless. The JLA decide to deliver Mars to “the top-security interplanetary prison”, which can no doubt hold a Roman God. And absolutely nobody says anything about returning Paradise Island to its proper place.